Mentioned in our podcast this week was the precursor to the Brooklyn Academy of Music, the three-story ‘centre of Brooklyn culture‘ known as the Brooklyn Athenaeum and Reading Room. Founded in 1848 and incorporated in 1852, the Athenaeum was a combination concert hall, store for intellectuals and library (in an era before public libraries), serving the gentlemen of the city of Brooklyn. Not only BAM but the Brooklyn Public Library traces its lineage to this structure which sat at the northeast corner of Atlantic Avenue and Clinton Street. It was also the original home of the Brooklyn Philharmonic. Perhaps the place was best known as a prime stop on the lecture circuit. Abolitionist Wendell Phillips spoke to thousands here in October 1860 — “crowded to its utmost capacity” — encouraging the Southern states to secede from the Union, months before any of them did so. 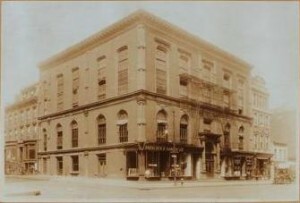 By the 1890s, the more elevated arts had escaped to other venues, and the Athenaeum hosted various political functions. Economic reformer and former candidate for mayor of New York Henry George spoke to a crowd of a thousand here on October 25, 1897, four days before dying of a stress-induced stroke. Events had wandered way off the original course by 1901, when police closed down the Athenaeum due to a planned meeting of East Coast anarchists. The following year, the top floor was occupied for three decades by the New York Court of Special Sessions. It was unceremoniously torn down in 1942. At some point a modest structure was placed on the lot, and today is hosts a Key Food supermarket. ALSO FROM THE PODCAST: One of the very first films shown at the Brooklyn Academy of Music (in 1921) was the Swedish silent romance Synnøve Solbakken (“The Fairy of Solbakken”), screened decades before BAM’s stage collaborations with Sweden’s greatest filmmaker, Ingmar Bergman. Looks like a spellbinding movie. Wish I knew Swedish! Film photo courtesy Flickr/Truus, Bob & Jan too!